It's not exactly the same as FIFA's Balon d'Or, but it was still a honorable moment when Cristiano Ronaldo received "As.com" sports award this last Monday, after being voted by a big percentage of the readers from this Spanish newspaper. 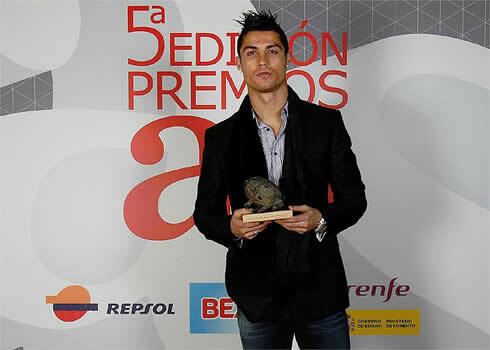 After a record-breaking campaign in Real Madrid's last season, where he reached the 40-goal mark in "La Liga", Cristiano Ronaldo got awarded with the Spanish newspaper "As.com" sports award, for the best player in 2011. 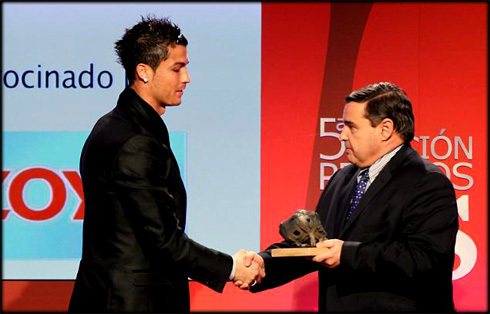 The Portuguese player was voted by 21,2% of the newspaper readers and received his trophy this Monday, in Madrid's "Hotel Palace". 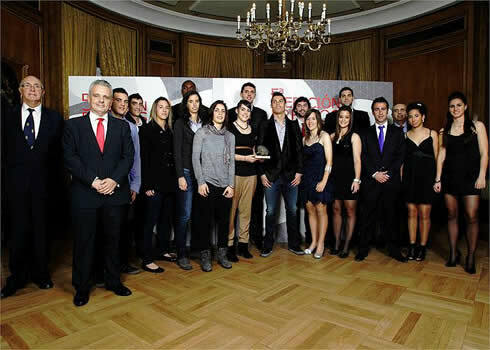 Alongside with Ronaldo, also the Spanish Basketball National Teams and the Spanish Tennis Copa Davis Team got awarded with a trophy, as a proof of recognition for their successes obtained during the last season, in their respective sports domain. There have also been a few debates on the merit of some of those goals, since 7 of them were actually obtained from the penalty-kick spot. As usual, CR7's detractors pointed that fact/stat, in an attempt of minimizing the Portuguese player achievements. But there's also a similar stat that should make all the critics bow upon Cristiano Ronaldo. The Real Madrid star has scored all of his 17 penalty-kicks attempts since the 5th of December 2009, in a streak that started after a penalty-kick miss against Almeria, in the Santiago Bernabéu. This Monday, when receiving "As.com" award, Cristiano Ronaldo didn't forget to thank his teammates and all the Madridismo. 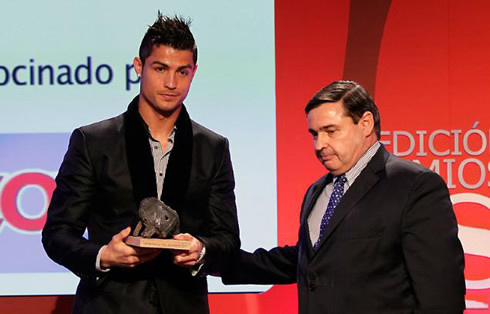 Ronaldo: "This award is a true honor to me. It's actually the second trophy I receive while playing alongside with these great athletes and it's my obligation to thank and dedicate it to them. I'm truly happy and things have been going my way in individual terms, specially because of my teammates, as well as Real Madrid fans and supporters", outlined the Portuguese player, when speaking his first words to the journalists. One of the questions that followed was about the Portuguese player's shelf and its eventual lack of space for more trophies. 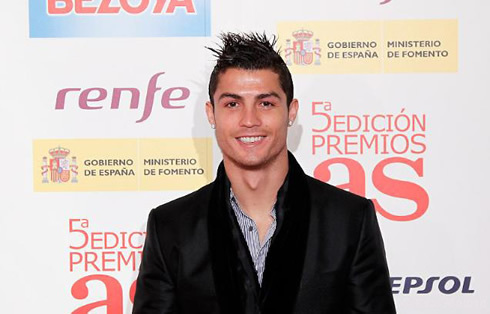 Cristiano Ronaldo doesn't see a problem on that: "I have enough room to every award at home. Receiving trophies is certainly an extra motivation to keep working hard and better, because that's the only path we can follow to obtain and win more things. I still have many years to play football and win titles for Real Madrid and that's something I'll never get tired of", alerted Ronaldo in his own unique way of showing how confident he is. Regarding the 6-points lead advantage that Real Madrid obtained over Barcelona in "La Liga" after this last weekend fixture, Ronaldo was a bit cautious and avoided being euphoric about it. Cristiano Ronaldo: "It's still too soon. Real Madrid is playing very well, we've been winning and we're leading the Spanish League, but it's still too soon to start talking about the "Pichichi" and about who's going to win "La Liga". The simple fact that we're winning games and playing good football, allow us to be more confident about our chances, but we never know if we'll be better or worse form, in just a few months", noted CR7 when answering the journalists last question. 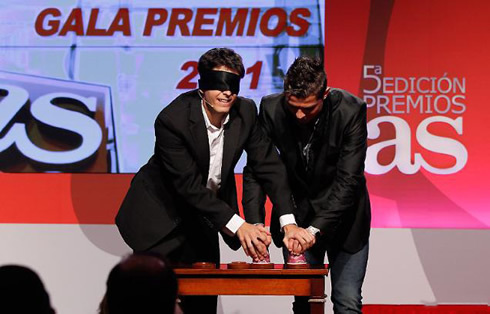 During the gala, Cristiano Ronaldo never hid his smile and he still had the opportunity to step up to the stage, after being invited to help the Spanish magician, Jorge Luengo, to perform a few magic tricks and entertainment moments. You may check some of the photos below. Real Madrid next agended match is against Sporting Gijon, for "La Liga", in the 3rd of December. In the meanwhile, this Tuesday you can watch Chelsea vs Liverpool online and Arsenal vs Manchester City live for the Carling Cup. That same day, you can also follow Barcelona vs Rayo Vallecano free for the Spanish League "La Liga". They are all available from our soccer live streams section.